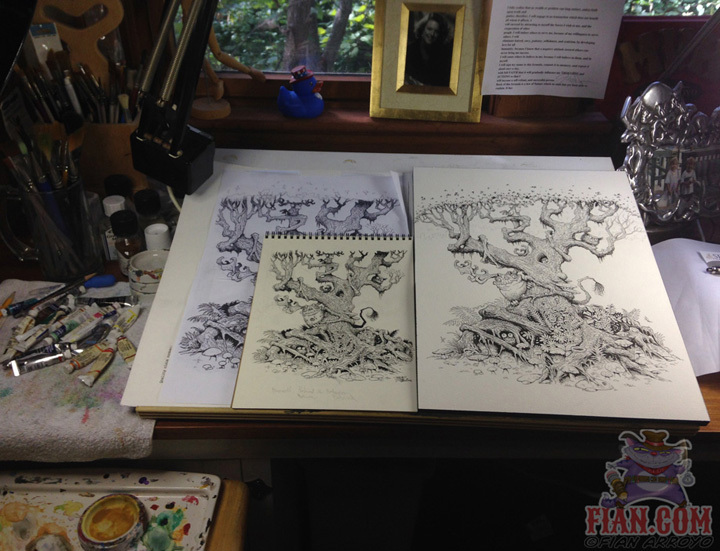 Here's a step by step progression into how one of my watercolor and ink paintings are created. This piece is called Discovering Truth In Ancient Fables. This was created for myself to sell as a fine art giclee print here in my shop at www.fian.com. A photo of my daughter sitting a tree on the Blue ridge Parkway on a misty day, was the inspiration for this painting. The original sketchbook doodle for "Discovering Truth In Ancient Fables". It was originally going to be called Beneath, Between & Behind but I wanted a title with a little more to it. I scanned the doodle printed it out to size to fit my 12x16 watercolor block which I had covered the reverse side with graphite to trace the drawing onto the paper. The traced drawing on Arches 140 lb. cold press Arches watercolor block. Using the original doodle as a guide for the line work I wanted to capture in the final art using my Pilot Namiki Falcon fountain pen. The final ink drawing complete. Painting the beginning layer of the tree with watercolor and the background in gouache. I wanted that opaque painted look in the background to get a misty feel. More of the tree and starting to get in some vegetation. Drawing and painting the plants is real fun for me…I don't know why but it is. The foreground, tree and sky are complete. Now to finish the rest of the critters and tree top. Done! Discovering Truth In Ancient Fables ©2014 Fian Arroyo. How it could looked framed on your wall. Pick up an unframed giclee print for yourself here.